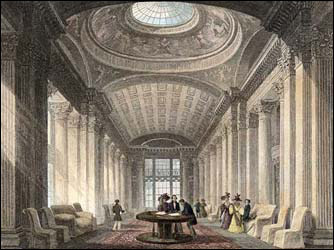 The shell of the Library, built in 1809-12 by Robert Reid, is overshadowed somewhat by the exquisite interior designed by William Stark, who never saw completion of his vision owing to his premature death in 1813. William Playfair took over the project at this point. Starks work typified good design and exceptional taste. A room housed within the upper library was described by George the IV as the most beautiful room he had ever seen.